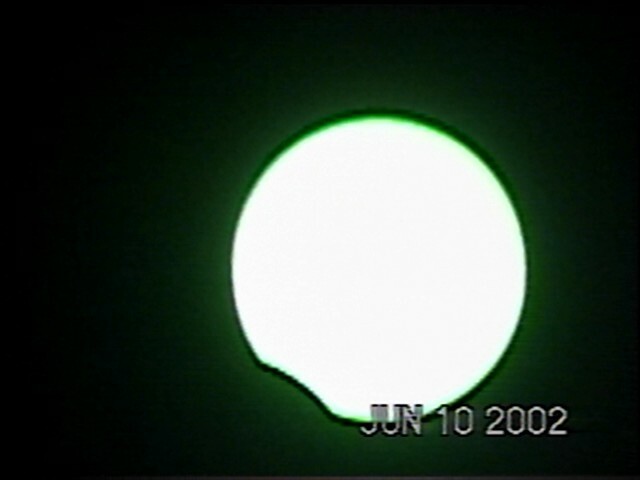 My 26th annular solar eclipse expedition was on Monday June 10, 2002. The date was coincident with Lynn’s birthday but since we planned to see the eclipse on the other side of the International Date Line, it would really occur on June 11. I decided to observe the eclipse from the island of Tinian (located in the Commonwealth of the Northern Marianas Islands) since the only other possibility would be to fly to Mexico and observe the moon’s shadow make landfall near Puerto Vallarta at sunset. Sunset and sunrise eclipses may be interesting for some to see, but from the science standpoint they are relatively useless. You are looking through the maximum amount of atmosphere and the sun and moon are distorted during the process. Tinian was a potentially idyllic spot, nestled just north of Guam in the western Pacific Ocean. However, since September 11, 2001, the skies have fewer planes and every aircraft seems to be completely full of people. We had to fly from Houston to Newark, Newark to Hong Kong, Hong Kong to Guam. But luckily we were able to use frequent flier miles to upgrade to Business class. Then, we overnighted at a dumpy hotel called the ‘Vacation Inn’ on Guam before flying to Tinian where we spent 3 nights prior to the eclipse. The highlight of the pre-eclipse activity was our flyover of the North Pole. To get from Newark to Hong Kong, flights are cleared to go directly over the pole and it was an eagerly anticipated event even though it was mostly overcast below us. The 15hours and 5 minutes seemed to fly by quickly as we watched movie after movie on the Boeing 777 aircraft. We next spent 7 hours at the new Hong Kong airport before continuing onward to Guam. On arrival in Guam the first problem manifested itself. My briefcase containing a camcorder, solar filter, radio, etc. jammed hopelessly and would not unlock. I had to break the lock and thus ruin the briefcase. Luckily we learned there was a 24 hour K-mart not far away from our hotel and we talked the hotel into driving us over to it. There I found almost an exact replica of my broken briefcase, a better backpack, and a new suitcase since our last one had cracked following years of travel. After two hours at K-mart all seemed right with the world! 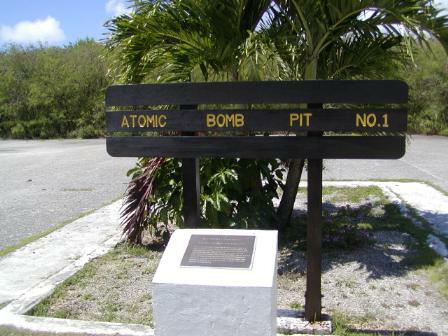 Tinian is a relatively small island with World War II history. Its claim to fame is that of the base where the Enola Gay took off to drop the first atomic bomb on Japan. We were able to see the still intact runways, concrete air raid shelters, deserted Japanese communications, operations centers and ammo dumps. It is ironic that so many Japanese visit Tinian given its history. We also visited a place called ‘Suicide Cliffs’ where many Japanese jumped to their deaths on the rocks below to avoid capture by Americans during the War. At the Dynasty Hotel we saw an ‘eclipse special’ advertised. For $50, tourists who had arrived at Saipan (a neighboring island with direct flights to Japan) could take the ferry from Saipan to Tinian, have breakfast at the hotel, watch the eclipse and return by ferry. 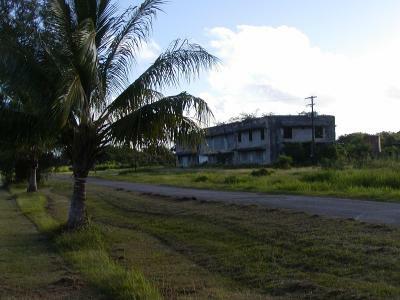 Our base of operations was the Lorilynn motel, a clean and cheap place to stay compared to the Tinian Dynasty Hotel – a very expensive property where only Japanese tourists can afford to stay. Not many tourists come to Tinian and those that do come to dive. They are pretty laid back on this island and even after numerous requests the hotel never would fax that our reservation was confirmed. Once they took your reservation, they considered you confirmed. 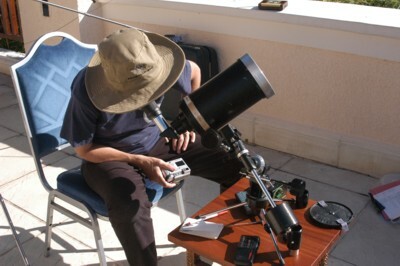 We met my friend Friedhelm Dorst from Germany who specializes in dangerous eclipse observation. He uses ND 3 or 4 filters to try to photograph the corona during annular eclipses — and he has succeeded! This was Freddy’s 37th solar eclipse and he found his spot on the hotel roof overlooking the mayor’s office with wedges and cinder blocks to prop up his two cameras. Now it was the moment of truth. In Tinian it was actually June 11 when the eclipse occurred (June 10 back in the USA). Mid eclipse was to occur at 8:11am and I decided on a site 2.74 km north of the northern edge of the path of annularity. After scouting the island the previous day we had seen every possible site. 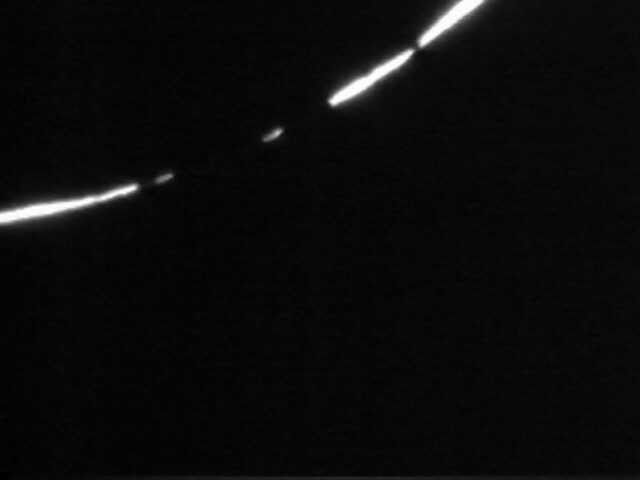 Being at this spot would not allow us to see a complete unbroken ring around the sun; instead it would permit viewing of the tangency between the moon and sun creating the Baily’s Beads phenomenon as sunlight streams through the irregular mountains of the darkened lunar limb. Hopefully, it would also be a location completely devoid of onlookers. My earlier date miscalculation was not without some consequence. I was not permitted to change our inter-island return flight that was set for 9:00am. This meant we had to observe the eclipse, drive to the Tinian airport in time to check luggage, return our rental car and get on the aircraft. First contact was at 7:02 am and Lynn and I were in place around 6:30. I had selected a site on the island’s main street called Broadway. On Tiniaan, though, the streets are not labeled and they don’t need to be if you live there since everybody knows which street is which. The site was on the median between the two lanes of the street on a mostly deserted roadway (although the major north-south road on the island). It was within sight of a World War II Japanese command post. The following 3 photos were taken by J. Lynn Palmer. Not far away were the pits where the atomic bomb was loaded on the B-29 that flew it to Hiroshima. The latitude of the island is only 18 degrees. 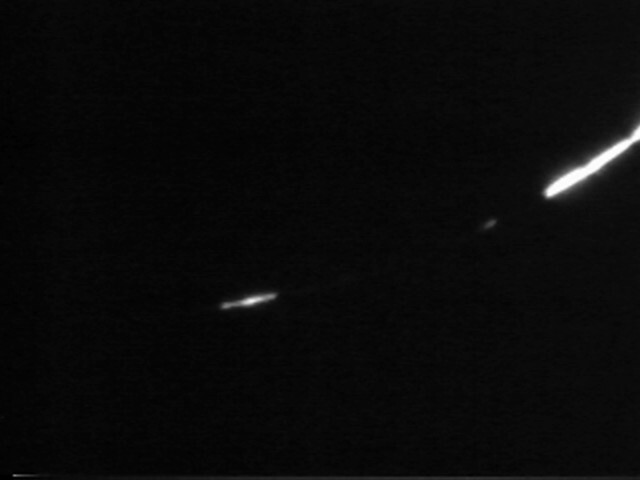 This meant that polar aligning our Meade ETX with video camera attached made the scope unbalanced. I was forced to use pieces of concrete to crudely counterweight the mount. However, owing to the mount’s small size and the moderate sun elevation, I decided to perch it atop the roof of the rental car where I could more easily access it. 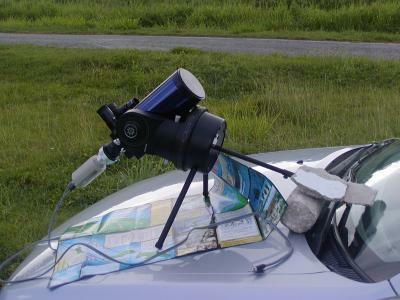 This plan almost proved disastrous when a strong gust of wind caused the telescope to slide from the roof to the windshield to the hood and the whole thing came crashing to the ground with parts flying everywhere! I could not believe it. I slowly picked up the pieces, expecting the worst, and began to reattach everything. Somehow, not one part was damaged and everything, including the delicate cables, were restored to their original attached configuration after a total vertical fall of about 5 feet. The sun was continuing its gradual climb upward in elevation and at mid eclipse its altitude was to be 34 degrees at 8:11am. The skies in the morning were generally 60-80% cloudy and as the day progressed, it had a tendency to become clear before noon. This morning it dawned fairly clear and it was not until 20 minutes before central eclipse when a broad deck of clouds covered the sun completely. To the south, near the notorious “Suicide Cliffs” where horde of Japanese tourists lay watching the eclipse, the sky seemed clear. A car came toward us during the intervening minutes, pulled alongside and stopped. The owner got out and asked about the eclipse. Since he had been the only vehicle we had seen that morning we wondered why he had driven by. He responded that if you had a cell phone and drove to the north part of Tinian, you could make a cell call for free if you stood in a certain spot that had good coverage. That was our eclipse site! After he made his call, he took off toward Suicide Cliffs leaving us to wait under the cloud deck. The Meade ETX was a newly bought telescope with no problems except one. Due to my frequent job travels, I had little time to prepare for the eclipse. So, I had forgotten to install the required 3 AA batteries that operated the motor drive; I had also left my tools at home. But because the mount had been decently polar aligned, the manual adjustment to track the sun was only needed in Right Ascension. As the minutes ticked by, the clouds seemed to have no pattern as they successfully kept the sun under wraps. Down the road every so often a patch of sunlight appeared indicating that rays of sun were reaching the ground through tiny gaps between clouds. By now, it was 2 minutes before central eclipse. I could now detect a clearing trend to the north and sent Lynn running with her camcorder up the road about 100 meters. There she videotaped the beginning of annularity. At almost precisely 8:11, however, the sun unexpectedly burst forth at my site and I was able to find the thin slender and now nearly circular sun with the black disc of the moon inside of it. I moved the slow motion knob quickly around the cusp to find that Baily’s Beads were occurring at that moment. I taped 1 minute 8 seconds worth of beads until the ‘ring of fire’ turned into a distinct broken crescent signaling the end of the action. I taped a few more moments before I realized that small but noticeable drops of rain were starting to fall. I then tore down all the equipment and packed it in. We gunned the Toyota down the road to arrive at the airport terminal just 6 minutes later. With the exception of two other people, we were the only fliers at that moment. Everyone else on the island was still watching the eclipse or blissfully ignorant of it. I was surprised to learn that our flight was in a tiny 6-seater plane. In front of the terminal a group of eclipse watchers were set up observing the waning phases of the event. Our 9:00 am departure took off early at 8:45. We flew over our observation site and saw absolutely no one on the north part of the island. By 9:05 we landed on the island of Saipan, not far from Tinian. We jumped out, ran into the terminal and then back outside to began to observe the last part of the eclipse. This is the first time I can recall having ever observed the same eclipse from two different islands. The following photo was taken through a Sony camcorder and welders glass. We decided to live large after this lucky and successful eclipse, and enjoyed a 7th floor ocean view room for one night at the Guam Marriott. It was great, and we needed something enjoyable like this in preparation for our lengthy flights home. The next day we took a 3.5 hour trip from Guam to Tokyo, and then were squished in cramped coach seats from Tokyo to Houston (11.6 hours). We agreed not to travel like this ever, ever again—-until November where we will attempt to view the next total eclipse from everyone’s favorite destination in southern Africa —- Mozambique.